That's why medical researchers use animals and why we brought Human & Canine Health information together in one "Place" so you can learn from your pets! Read this, then face your house dog... Is he on tranquilizers? Addicted because YOU became part of a national disgrace to pet owners and the veterinary profession? Tranquilizer addiction should worry caring owners and conscientious veterinarians. This will blow you away even though you know that human drugs are first tested on laboratory animals. 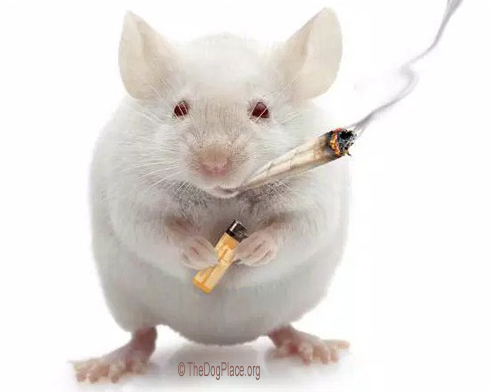 We accept that a rat is a rat is a detestable pest but there’s something to be learned from drug studies using rats – and it applies to our doped up pets and equally to our children. 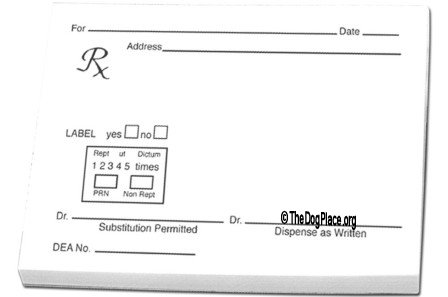 Even if you don't even know anyone who uses behavior modification medication, your house pet BEGS you to read this! As a grandmother first (cat fancier second) I was taken aback when I heard about the “Rat Park testing" conducted in the 1970s by a psychologist-professor in British Columbia. Concerned parents and diligent drug addiction researchers searching for help are unlikely to stumble across the "Rat Park" example. My neighbor, whose nephew is being treated for drug addiction, told me about this and suggested I write about it. People do that all the time and sometimes it turns into a column. If someone you know is suffering from drug addiction or your pet is on tranquilizers don’t click out!!! 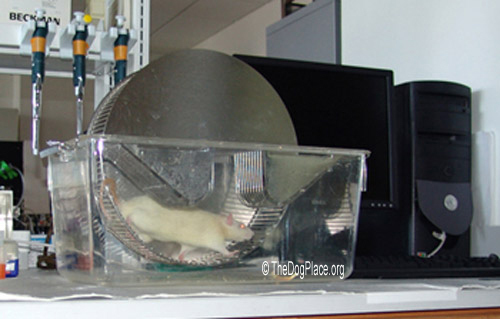 Dr. Bruce Alexander “suspected that the preference of rats to morphine over water in previous experiments might be affected by their housing conditions.” Picture this: a lab rat lives alone in a tiny cage. Rats, like dogs, are social critters (that “multiply like rats”) and in their natural environment, they would have an acre or more to explore. Exactly like your dog, rats are driven to sniff this, taste that, dig and mark territory, seek a mate, and reproduce the species… Hold that thought. You are about to get a big dose of perspective on dog ownership. Back to the scientist. Testing drug addition, he decided that living in a tiny cage with no social interaction robbed the rat of sensory input. Dr. Alexander concluded that his drug addiction tests were flawed by typical lab environment (think living room window for your cat or fenced yard as regards your dog) and so he built a bigger enclosure. Dr. Alexander built a big cage called “Rat Park” and it was 200 times bigger than the solitary confinement laboratory cages. He was a kindly guy so he put exercise wheels in the cage. (picture your dog’s immediate ancestor running for miles across the tundra.) He gave them more food and best of all, he put the lab rats all together. Here’s where the experiment made history. I called my daughter and we had a talk about her spoiled teenagers. Then I thought about the average house pet, especially cats. They are stalkers not chasers like wild dogs, but even so, it is the concentration and mental activity I’m thinking about. Now what about a house dog. He can scratch. Chew his feet. Check his built-in watch. Think about supper. Scratch some more. Bored beyond belief, he can dig a hole. In the sofa. Dogs don’t project into the future, he doesn’t “know” that will make you mad. He just does it. An “inside dog” alone all day is comparable to the caged rat. No wonder he goes nuts when you get home! He’s been unbearably stressed all day! His genes and physicality were designed to run for miles (or at least a city block) chasing prey. His incredible brain developed by solving problems. 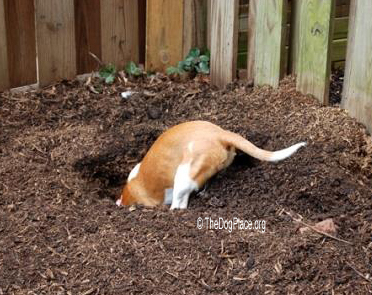 With the help of his nose and mouth, he learned to find where he buried his bone of if he's feline, which tree he stashed it in. He stayed busy hunting, eating, seeking a mate, and marking his territory (God forbid it’s your golf bag or new skis you left leaning against the wall). When you come home, of course he’s thrilled to see you. He might even jump on you, run circles around you… bark and slobber in excitement. Do you scold him? Or do you take him out to the Rat Park? Nothing more to be said on behalf of the once-wild dog. Well, except please remember Rat Park when the vet suggests a tranquilizer or something to “stop the chewing” or “barking all day” or “spinning in circles” or “wanting so much attention.” I looked up tranquilizers. Acepromazine, phenothiazine tranquilizer, diphenhydramine (trade name Benadryl) are common canine tranquilizers but because they are in “common” use does not mean they are safe and certainly not as a substitute for adequate mental and physical exercise! If you can’t give your pet the time, the mental stimulation and exercise nature intended, be kind to your dog or cat - find him another home. Please do so before you dope him up or dumb him down with tranquilizers, sedation, and anxiety medication to stop anxiety you can fix. Medication does not cure the boredom and lack of exercise problem. Cats are not as badly affected but don’t they love a session with the Kitty Tease or some other toy? To them it is like chasing a ball is to your dog. Be kind to your pet. I hope this helps. 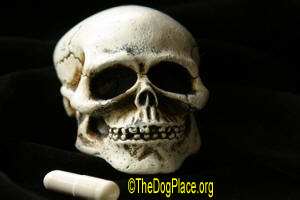 The sick truth about DogMeds and human medications. A heap of truth goes a long way when it comes to prescriptions. 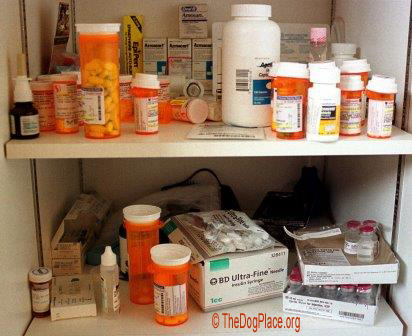 Supplements you may take yourself or give your dogs.